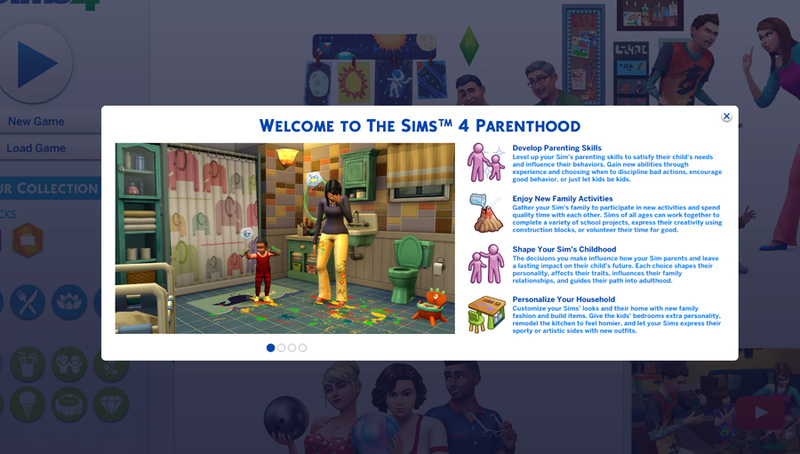 The parenthood game pack is probably one of the most hyped Sims 4 packs since release of the game with many simmers being excited for new family gameplay instead of the ever present young-adult-party theme. 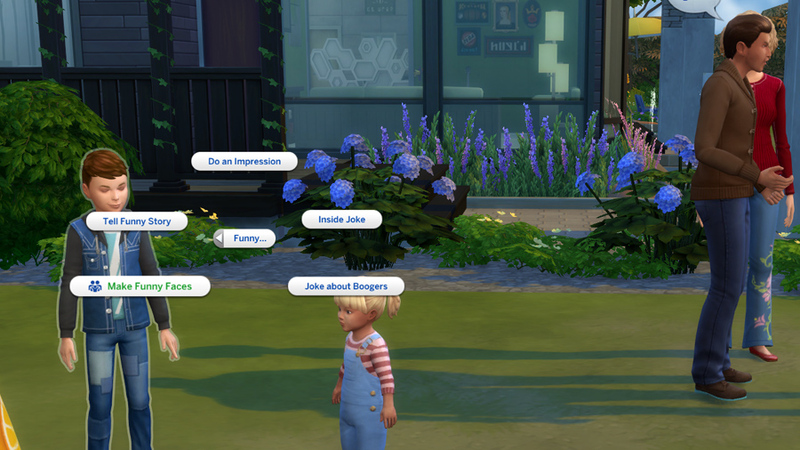 It promises parenting skills, shaping your sims kids childhoods and new family activities. 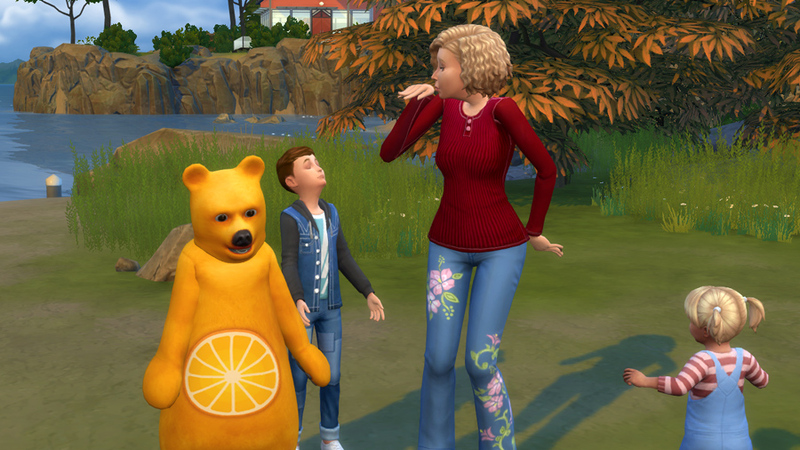 And while the pack doesn’t quite come through on the hype it’s finally a pack that’s focused on kids and teens and adds a new layer of depth to family play. Now let’s dive into the details, shall we? 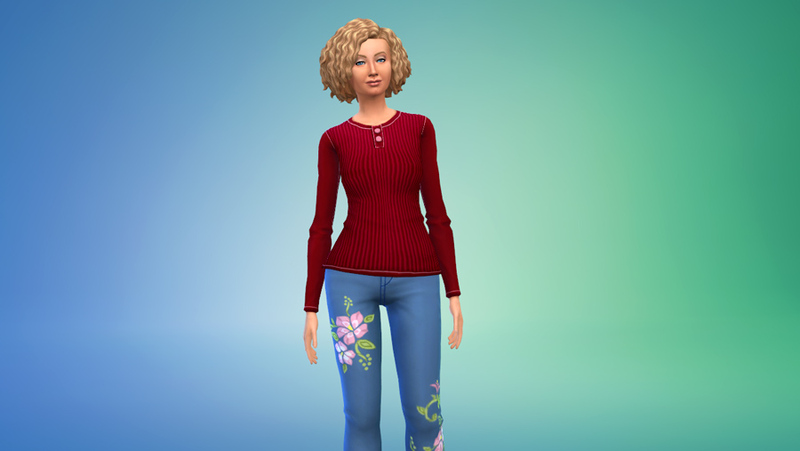 I’m not doing a full-blown CAS review this time because there’s simply not that much stuff to show. 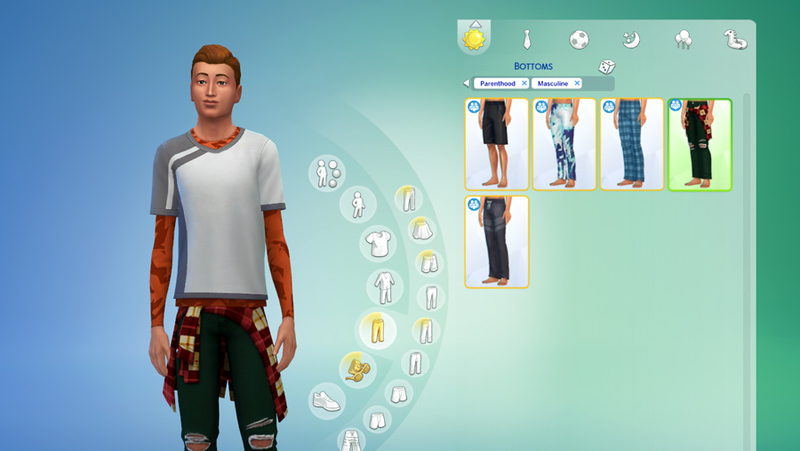 With only one new full body outfit for adults, no new shoes and no new accessories, the pack does fall a bit short on the CAS side in terms of numbers. The things we do get are mostly catered towards teens with 2-3 “adult” items for each gender. 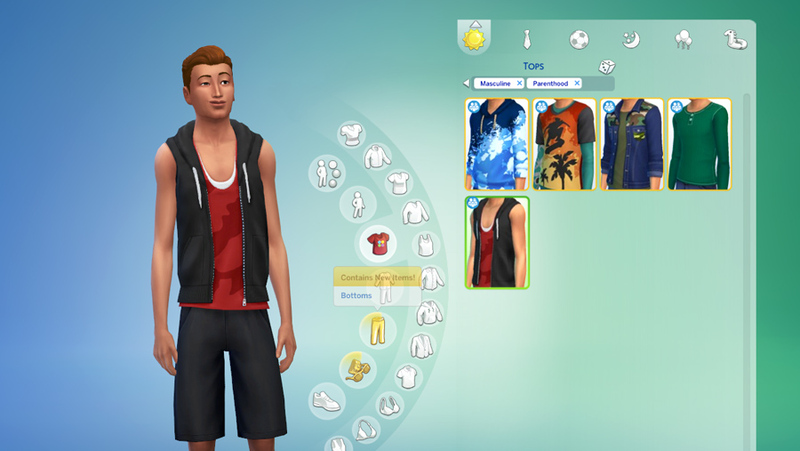 This is a nice change since previous packs gave us mostly adult clothes which teens were also allowed to wear. 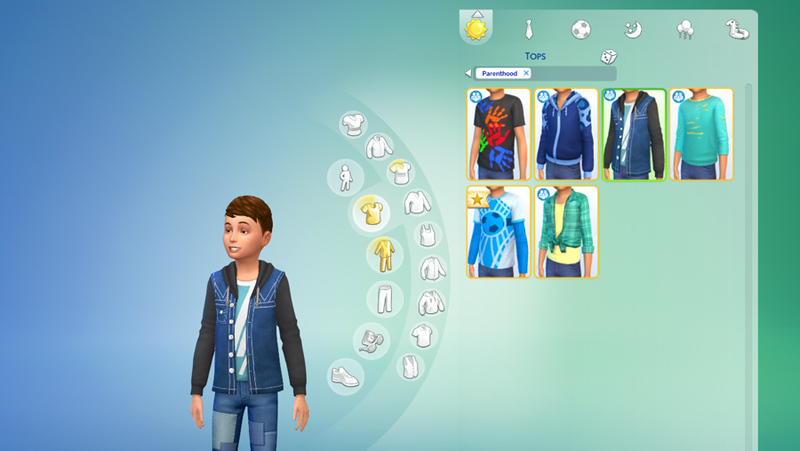 This pack has some neat hairs and clothing that are clearly catered towards teens (and they do look kind of weird on adults). 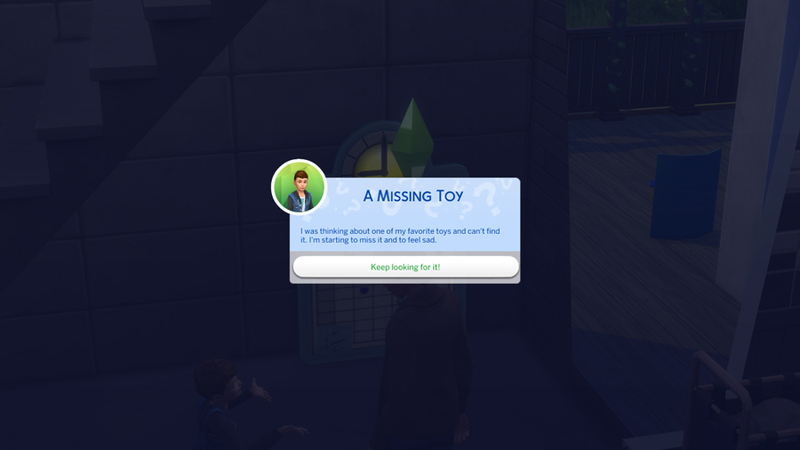 Kids also get quite a few new things! I like many of the kids things especially since kids stuff often fell short in previous packs. Here are a few examples. 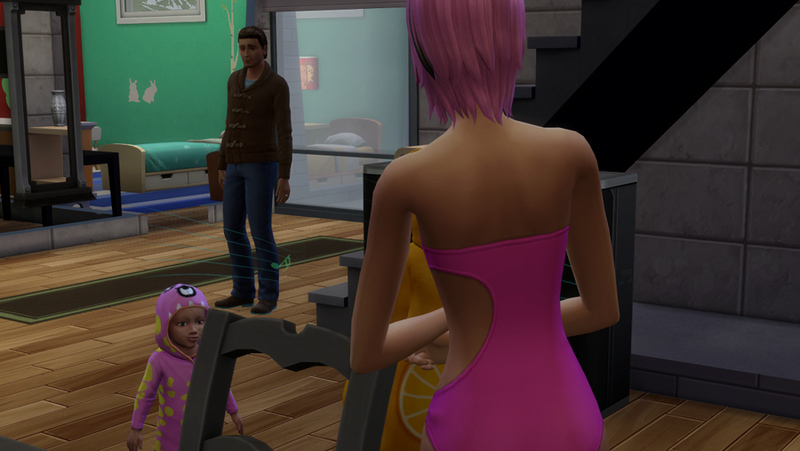 Toddlers got the short end of the stick. 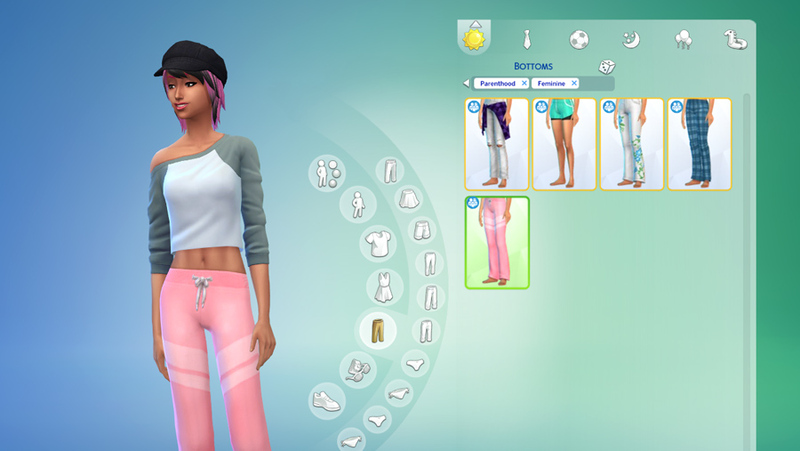 Only two new outfits and a pair of tights. 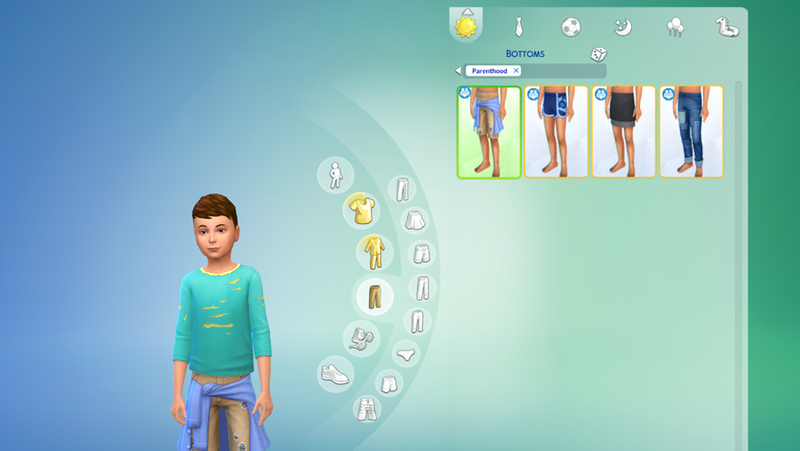 CC is still your best bet for toddler clothing variety. The items we do get are pretty cute though. What’s that one full body outfit for adults you ask? See for yourself! 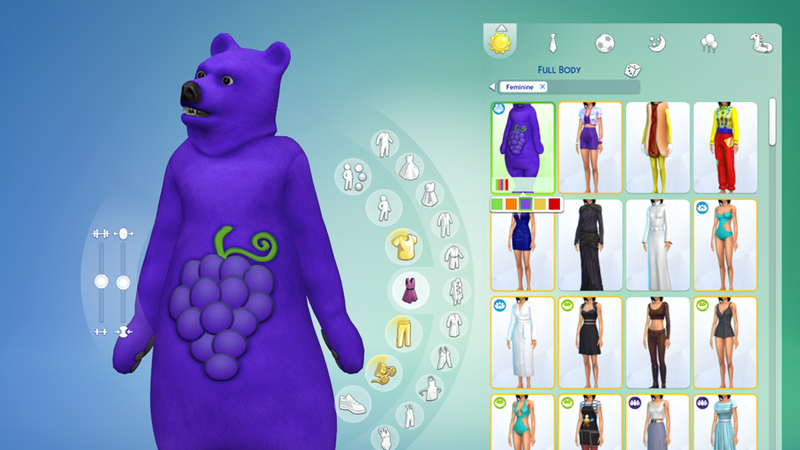 Yep, there’s a total of 5 new fruit-themed bear costume options. They’re available for kids too. While these are pretty hilarious, I’ll count them as more of a gimmick. 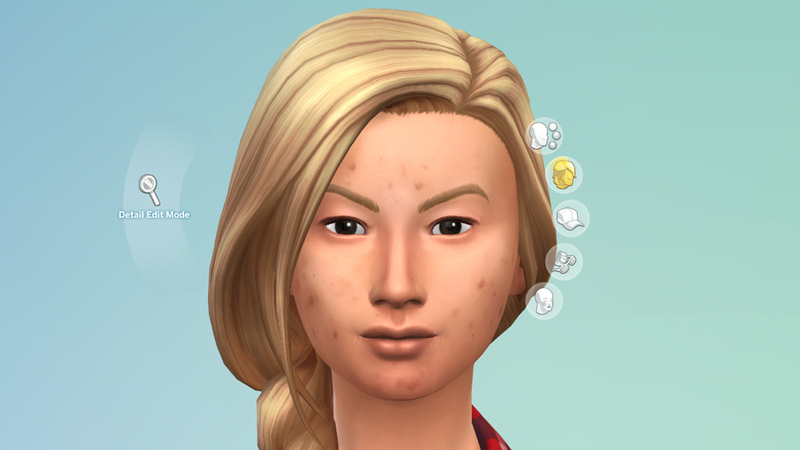 One thing was added though, that I really like and makes the “Everything-is-happy-and-perfect”-Sims 4 a bit more realistic: Acne! In facial details, you’ll find 3 severity levels of acne for teens and adults. From a single pimple on the chin to spots all over your face. Very pleased with this addition! 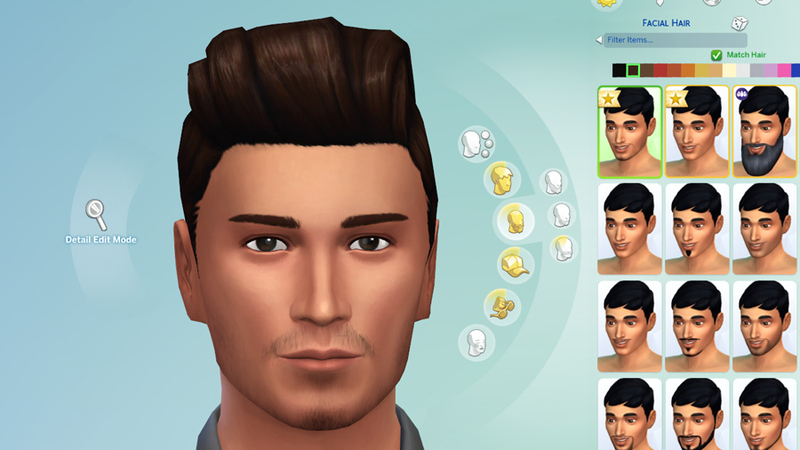 Another thing that gives the CAS-portion of this pack a plus for me are the two new facial hairs. They’re subtle but still look great! All in all, I have to say there was more potential here. 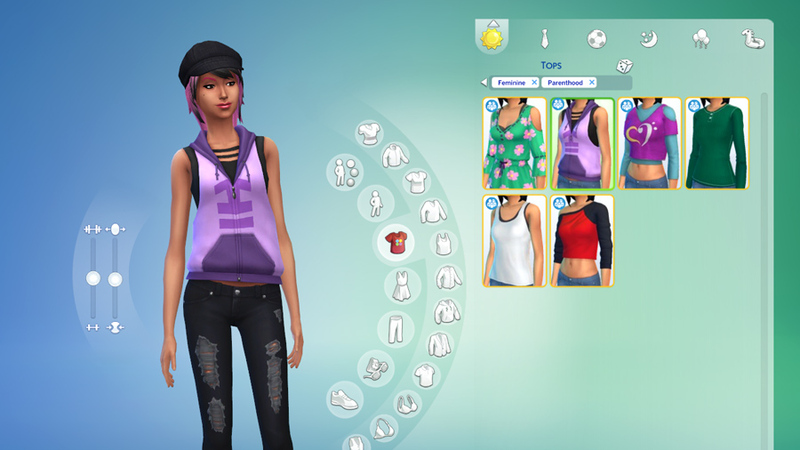 So many other teens outfits could have been created! 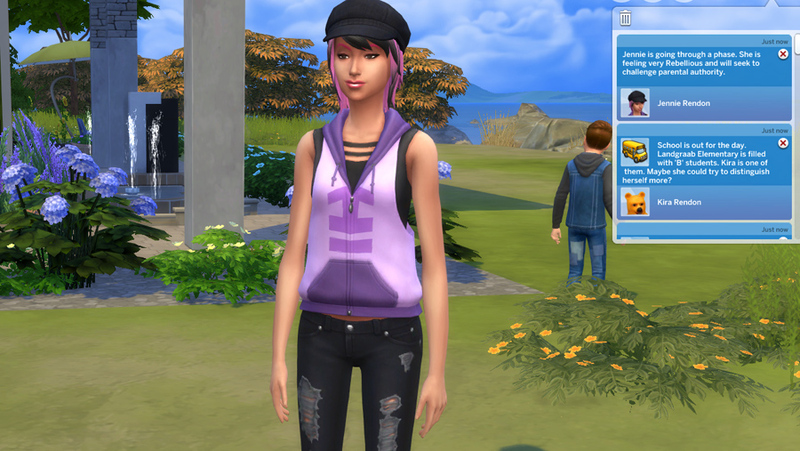 But I like that the majority of the items is aimed at teens and kids and the items we do get are nice. Also, Acne! A brief comment on the build & buy items in this pack. I like them a lot! If you’re looking for modern items you’re wrong here but there’s a lot of clutter and items that make your house feel more homey and lived-in. 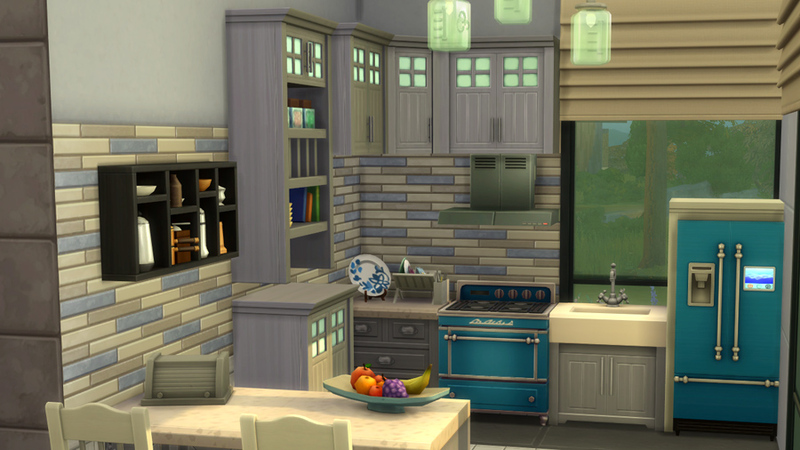 I especially dig the new kitchen! 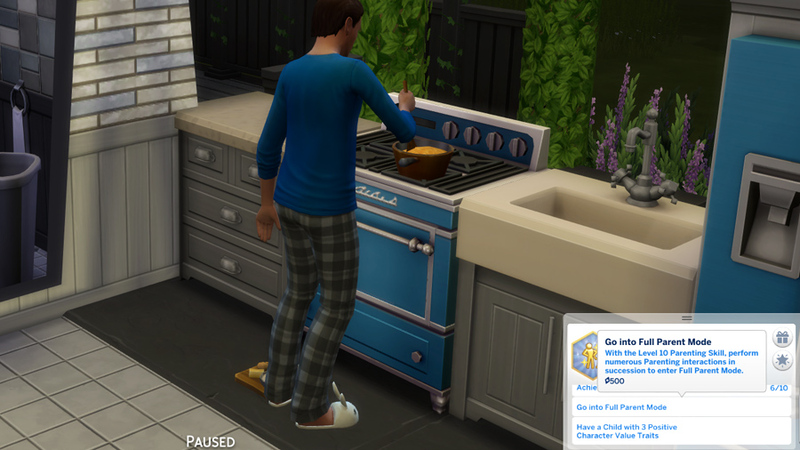 Mildly infuriating though: There’s no counter color to match that blue fridge and stove. Grrr. 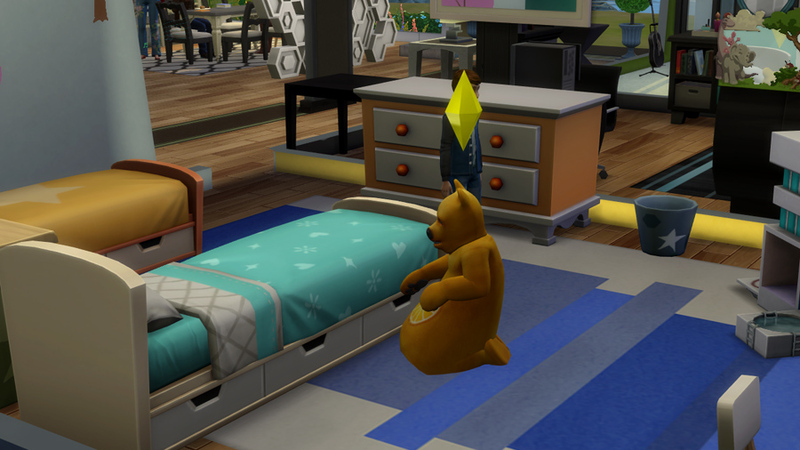 There are two new beds which are both single beds. Teens like big beds too! 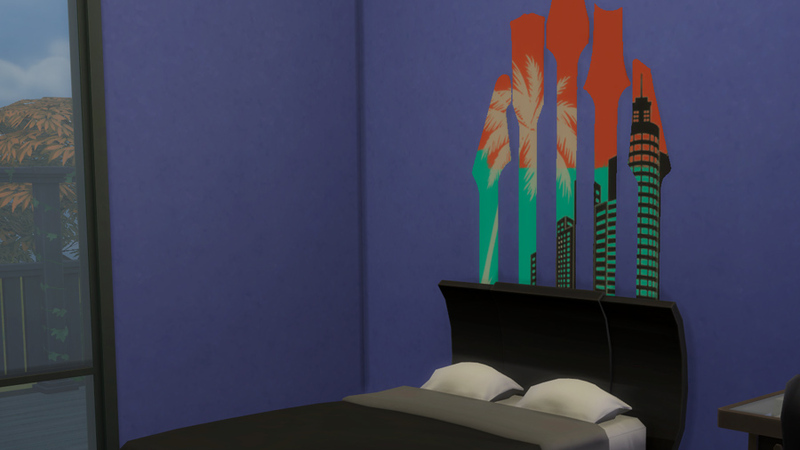 and this wall decal just wants to be placed above a headboard. 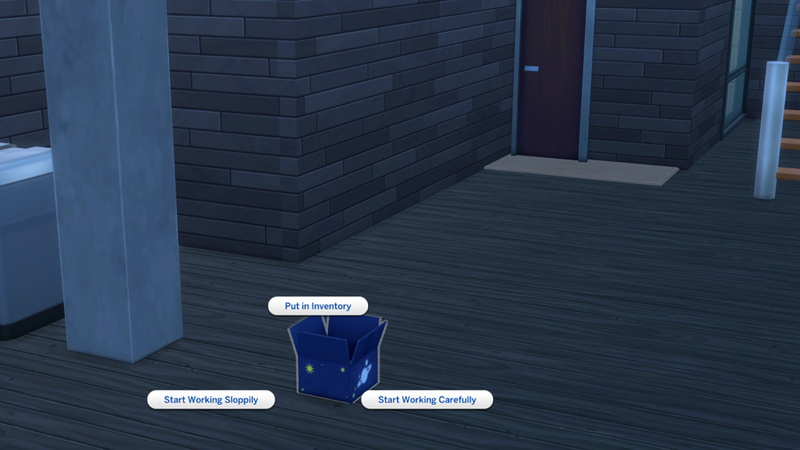 Also, there’s a laundry basket item. A hint, maybe? Let’s talk gameplay! This is undoubtedly the heart of the pack. I’ll talk about the bulletin board, character values, the journal, the parenting skill and general gameplay stuff. The Bulletin Board is a buy-mode object that you place in your families house. You can leave notes or drawings on it and parents can set curfews for the kids. 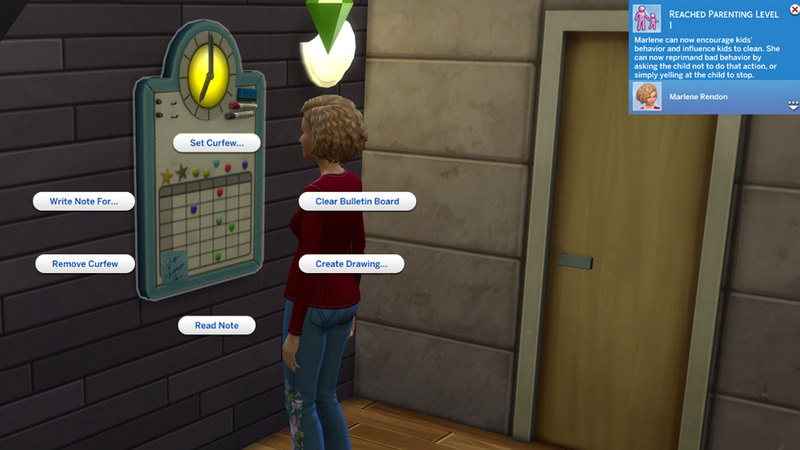 Using the bulletin board will also count towards the parenting skill (for parents only, obviously). The bulletin board is a nice item, but I expected more from it. 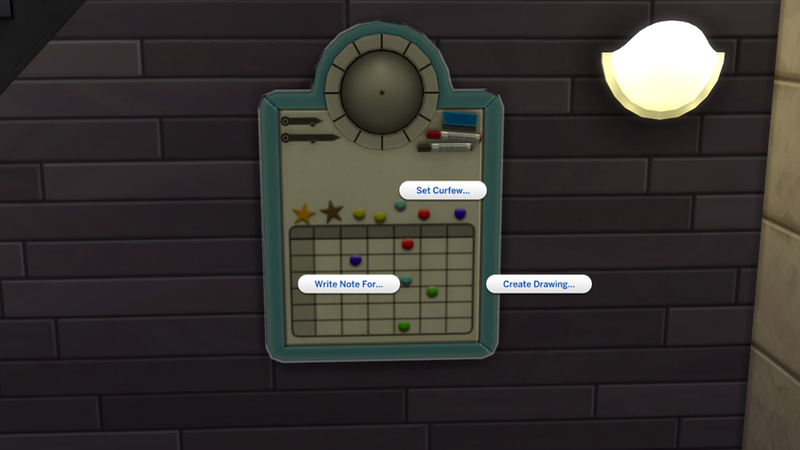 Notes and drawings look good on the board but aren’t actually useful apart from granting a happy moodlet (which, let’s be honest, we can get enough of elsewhere). You can’t specify what kind of note to leave for a family member nor will these notes have any effect on kid’s behaviour. 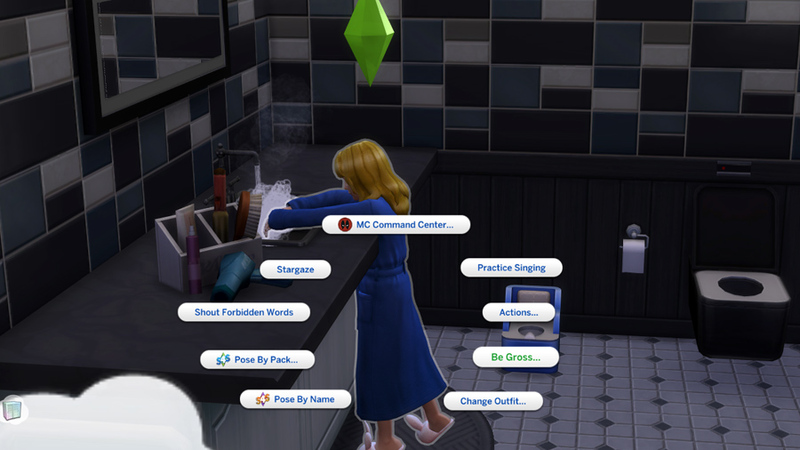 Why can’t I leave a note for my teen daughter to do the dishes? Gosh, I’m seriously disappointed thinking of what this feature could have been. You can decide to set curfew at either 7, 9 or 11 pm. No custom times? 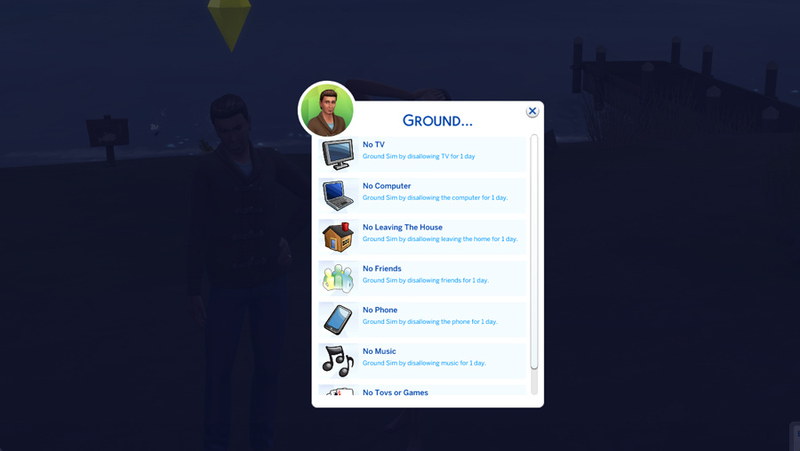 That’s sad… Also you can’t set different curfews for kids and teens. A bit unrealistic, isn’t it? There seem to be a lot of missed details here. Curfew is still the most useful part of the bulletin board. You’ll get a reminder that certain actions during curfew hours will break curfew, like travelling or organizing social events. Curfew is not broken by staying out within the same neighborhood, though. Again, missed potential. Being out of your house during curfew should break it, even if it’s the same neighborhood. When your child is out and about during curfew hours doing literally anything will break curfew. When a parent catches a child/teen after doing something curfew-breaking or when coming home after curfew, the parent can choose to discipline their kid, for example by grounding them or giving them a firm talk. I’ll talk more about disciplining later. 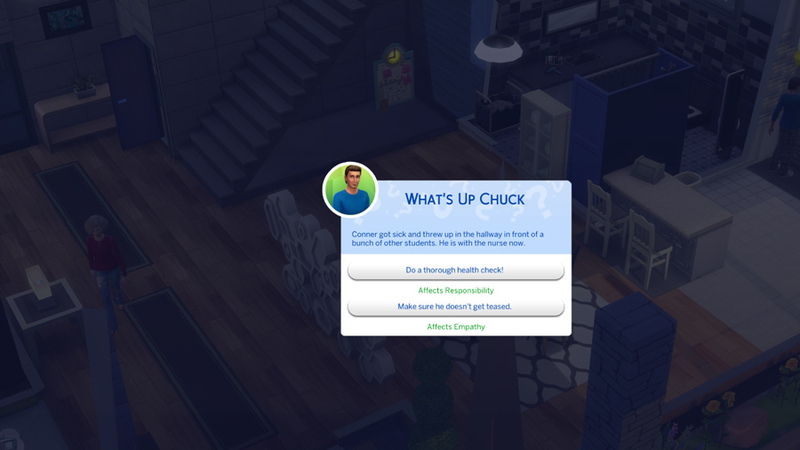 Easily the best addition in this pack: Character values! 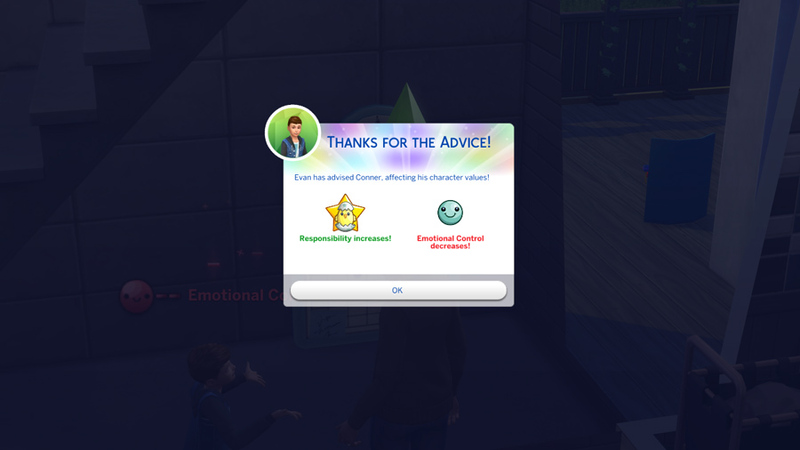 Toddlers, kids and teens now not only have traits but character values that can be influenced by their actions or by parents. 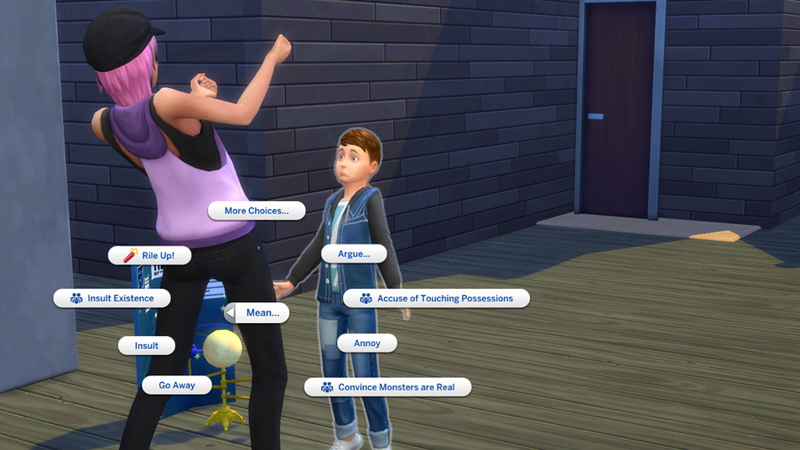 When a character value is high or low enough, the child will receive an according trait upon aging up to young adult. 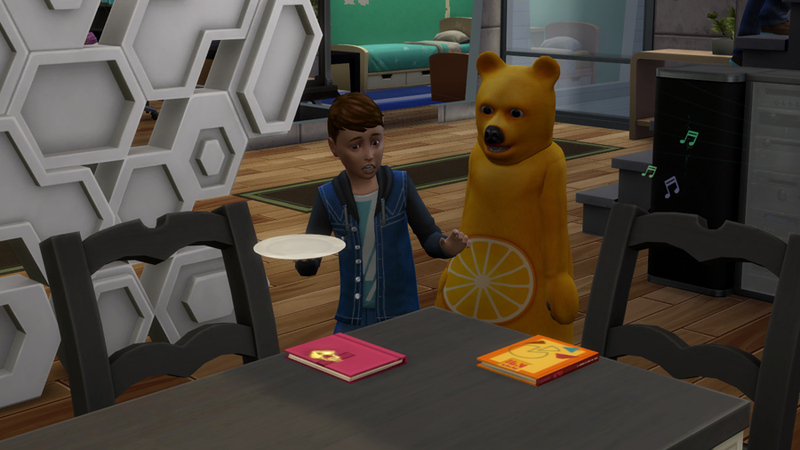 Now this is a great way of actually shaping your sims’ childhood! The five character values are Manners, Emotional Control, Responsibility, Empathy and Conflict Resolution. 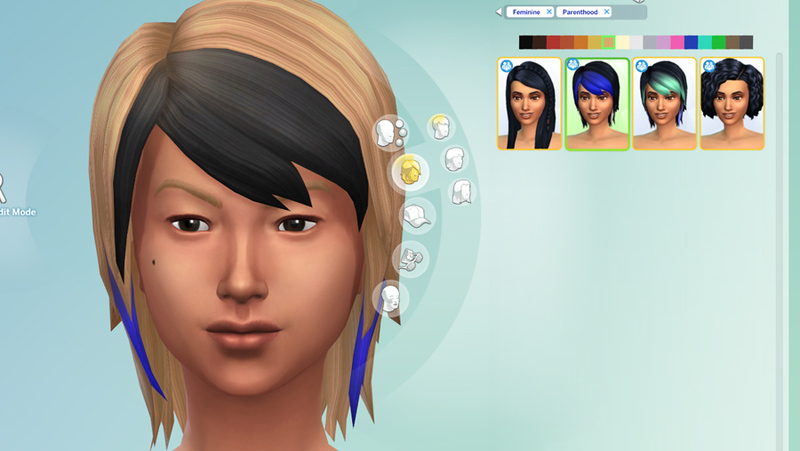 The traits you give a sim in CAS can already influence their character values. 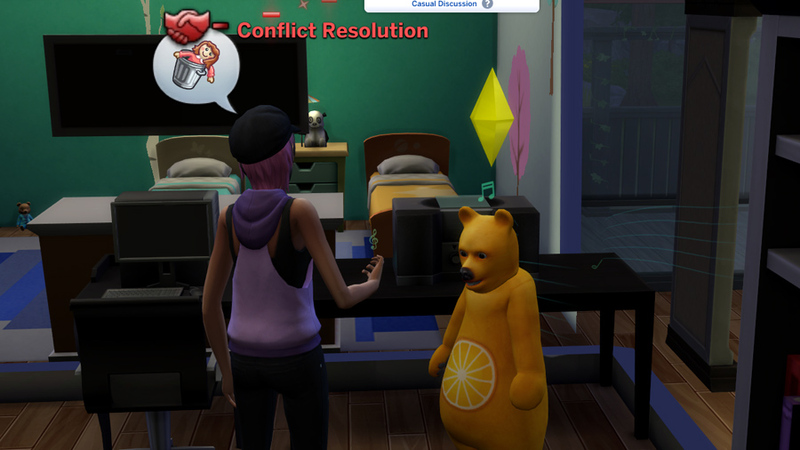 For example my hot-headed teen already had negative conflict resolution before actually doing anything. Character values can be influenced by a lot of things. When you hover over a value, it will show what kind of interactions influence it positively or negatively. 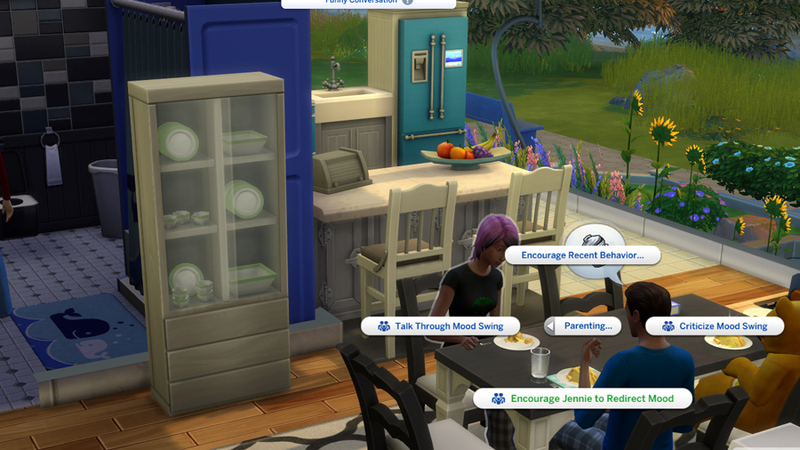 Most interactions that influence character values have to do with talking to other sims. 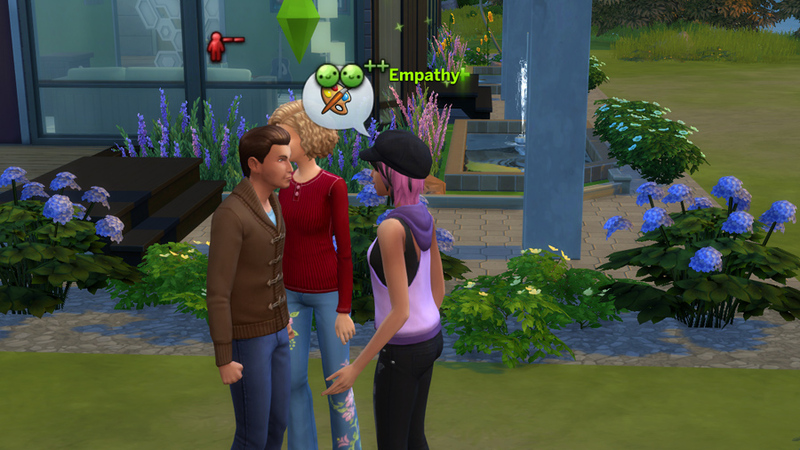 For example friendly introductions increase manners and sharing problems with another sim increases empathy. Then of course, fighting decreases conflict resolution or emotional control. Best find out for yourself what actions influence your kids in what way. It’s fun to discover! 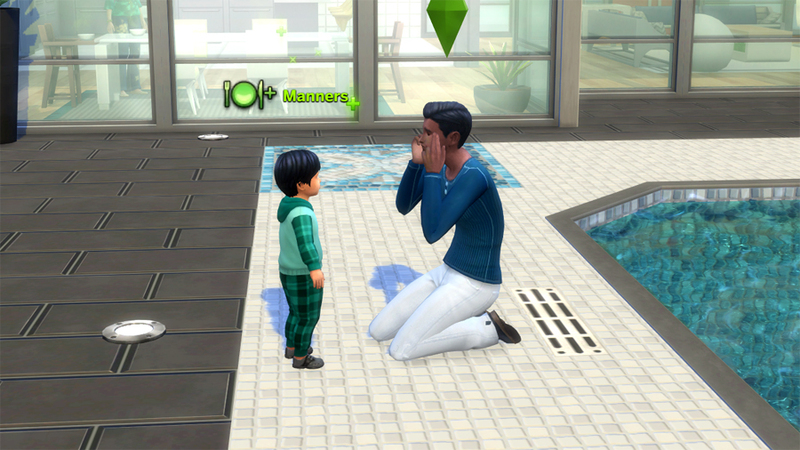 Parents can also influence the character values of their kids, for example by giving advice in teaching moments. 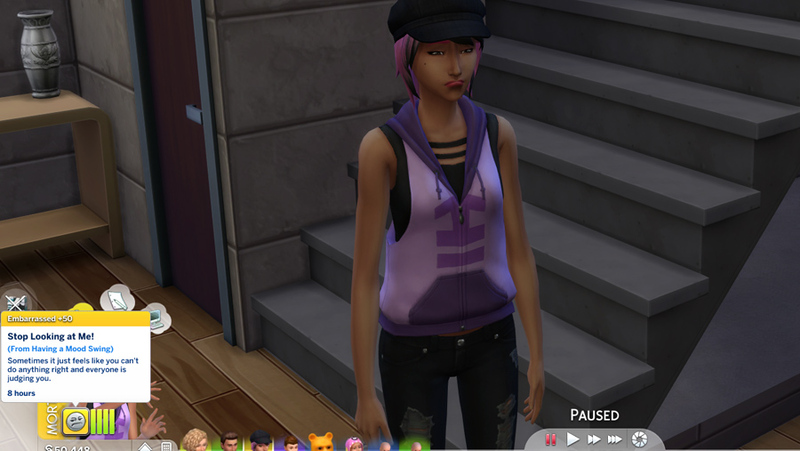 These moments will sometimes pop up and ask your parent to give advice to their child. Low skilled parents will only have one option to choose while parents with higher parenting skill can get up to three options! 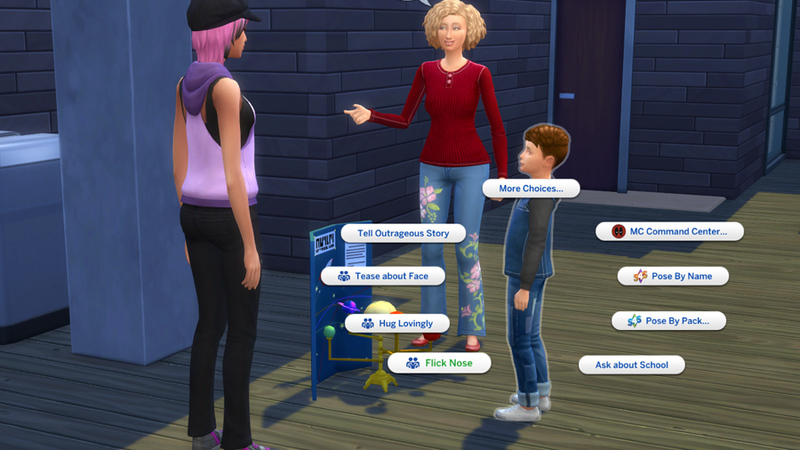 Any option you’ll choose will increase one and decrease another character value of the kid asking for advice. More skilled parents will also know how the advice they give will influence their child. This way you can decide which character value you want to increase. You might also get teaching moments while kids are at school. 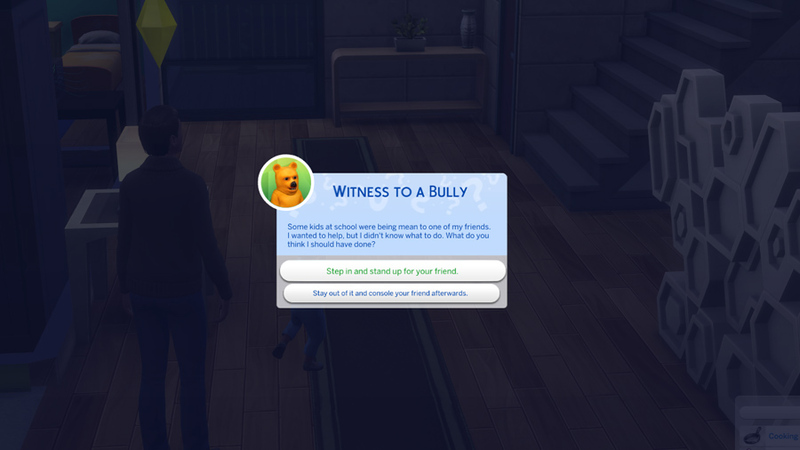 Then you’ll have to give the school advice on how to deal with a situation involving your child. Apart from teaching moments, disciplining or encouraging children affects their character values. 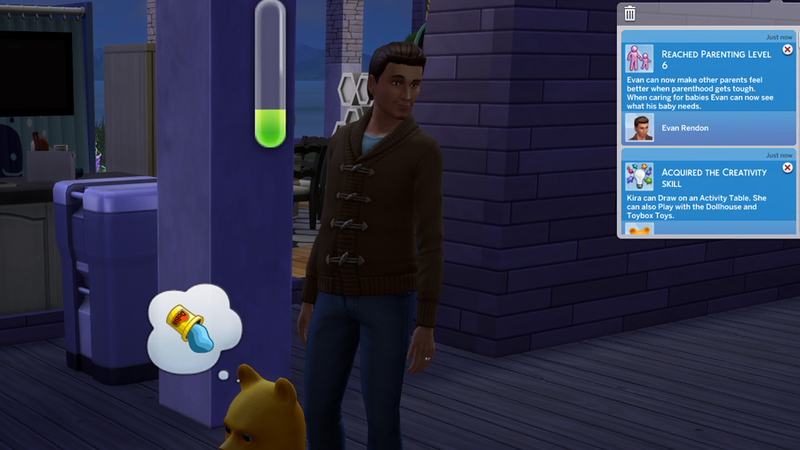 Have you played with Pets in The Sims 2? The system here is similar. When a child does something, you might be able to discipline or encourage them about it. For example you can encourage your kids after they finished a school project, after they did their homework or after they did the dishes. Since encouraging kids after homework and school projects boosts responsibility, it was the easiest character value to increase. The others are a bit more of a challenge. Apart from encouraging kids, you can also discipline them, for example, for being mean and arguing. Or, in case of toddlers, for splashing in the toilet. Character values are awesome! They make children feel more fleshed out and more like actual kids. Disciplining and Encouraging adds a new layer of depth to parenting that I really enjoy. 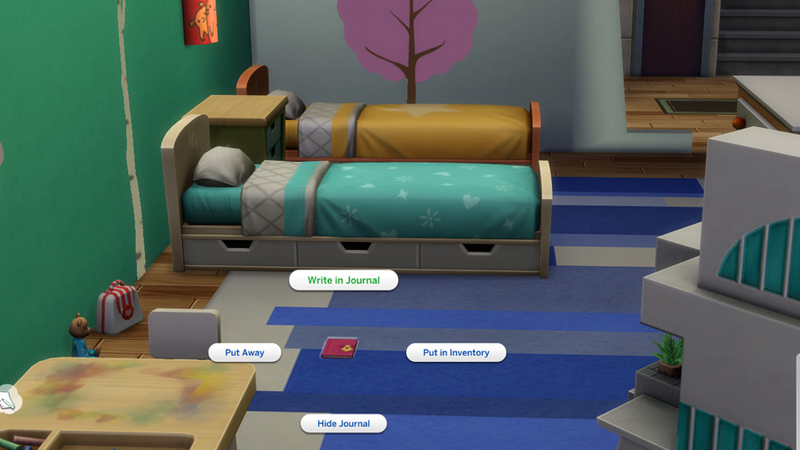 The Journal is a new gameplay object which sims of all ages can use! 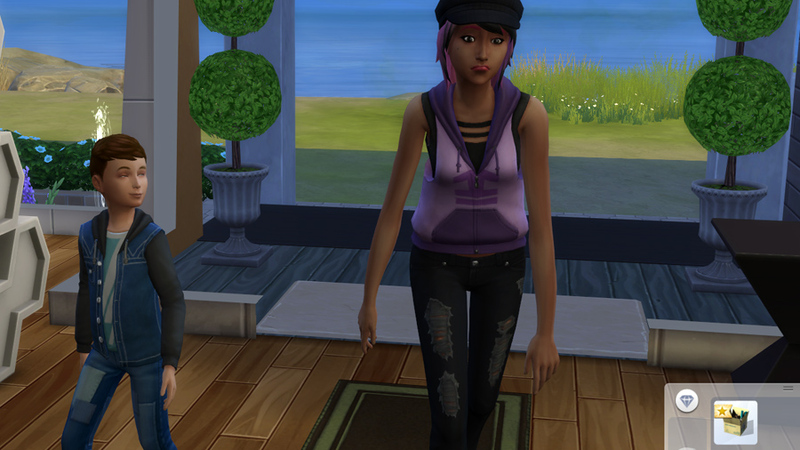 When a sim writes in a journal for the first time or interacts with it, it becomes theirs. Writing in the journal positively affects emotional control. 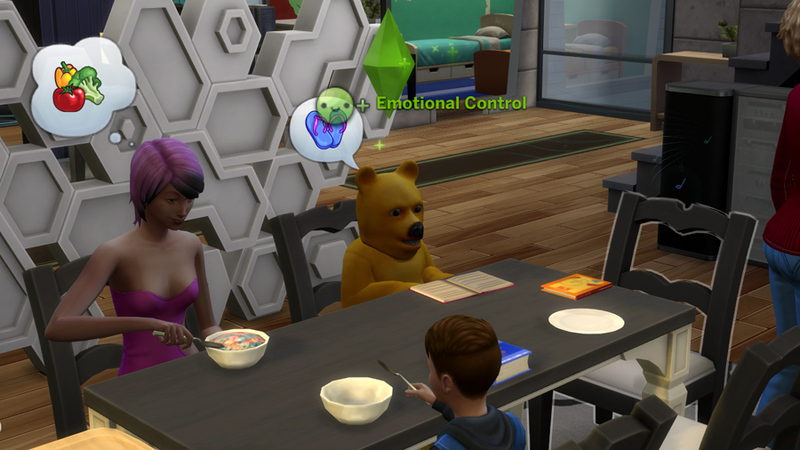 The emotion the sim is in while writing is also important. 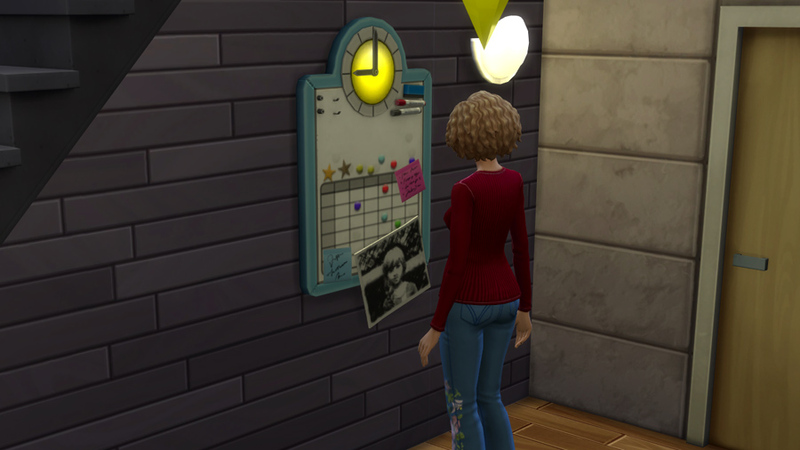 A sim can choose to relive the memories of the journal and receives a moodlet from one of the moods the journal was written in. 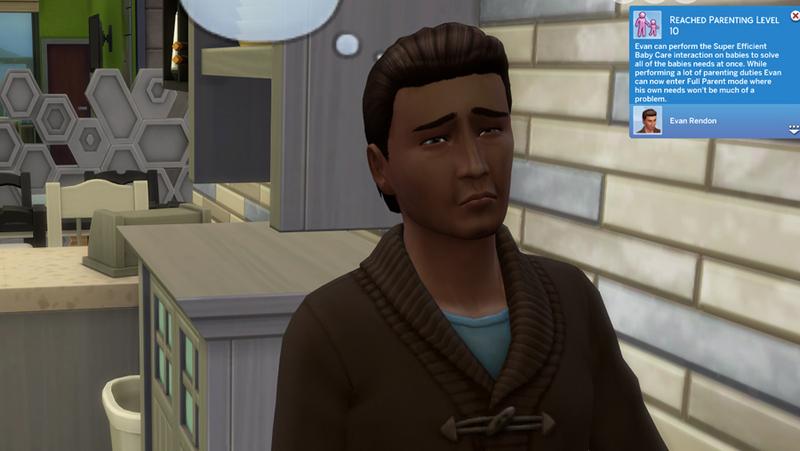 So if a sim writes in the journal while angry and later relives the memory they’ll get an angry moodlet. 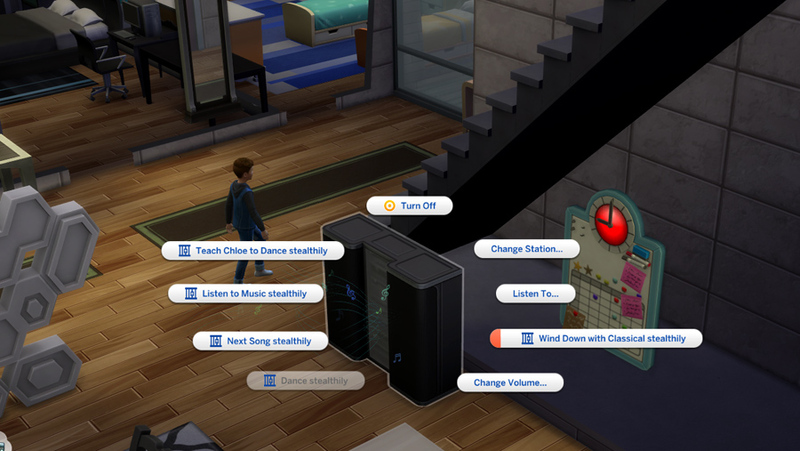 I really love this addition so much! 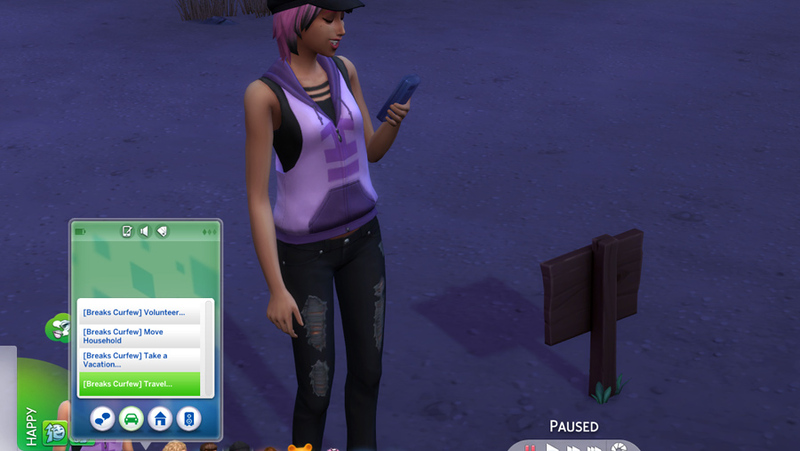 Sims can also hide their private journals. 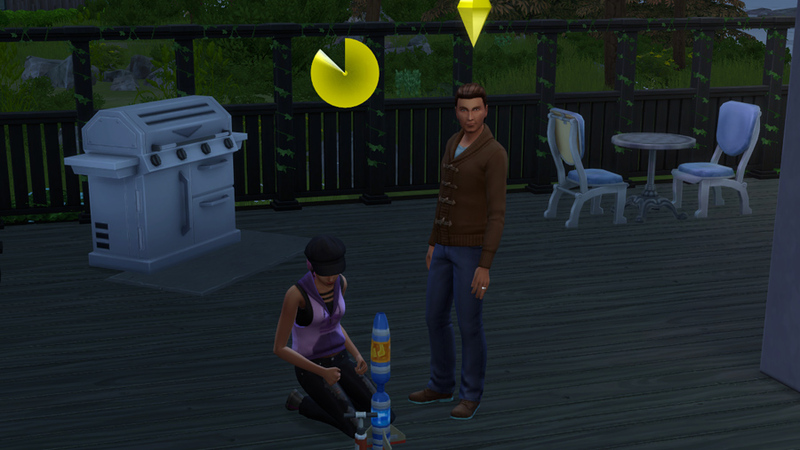 But beware other sims can steal them and snoop in them! 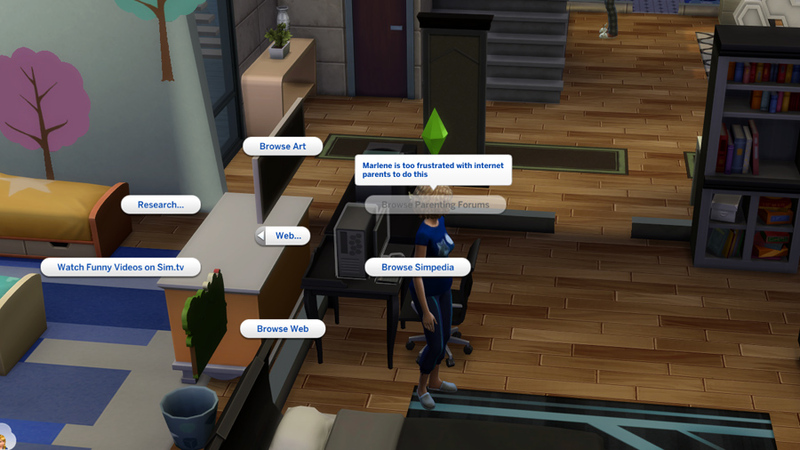 Snooping also gives moodlets for the snooping sim. But beware of being caught with the journal of another! 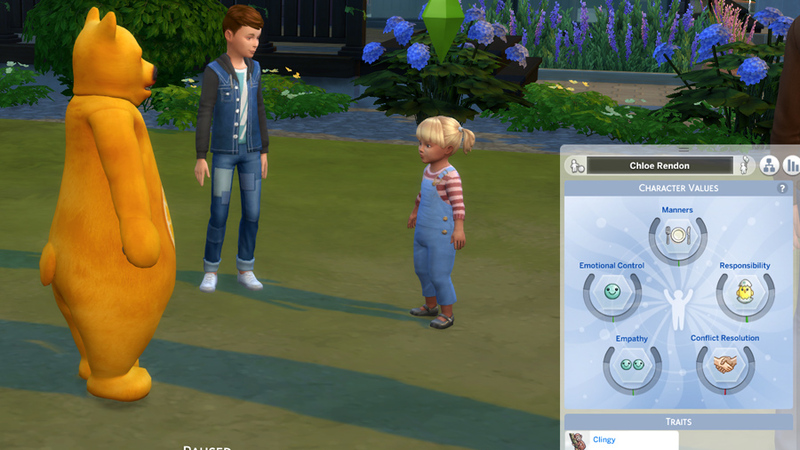 The parenthood gamepack adds a lot of interactions that make you family feel more like a family. Like kids acting up against their parents. Be aware that many interactions added with this pack are negative ones that will negatively affect relationships. I like that though! 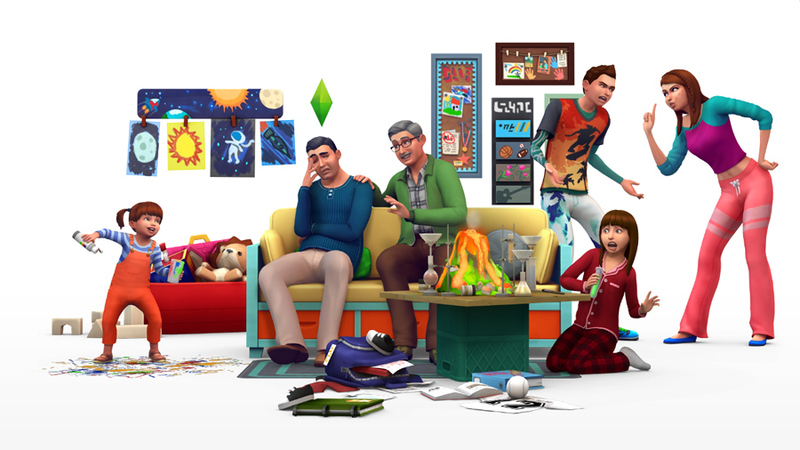 Whether it’s kids vs kids or kids vs adults, a bit of arguing and not-getting-along makes the game and families seem a lot more realistic! 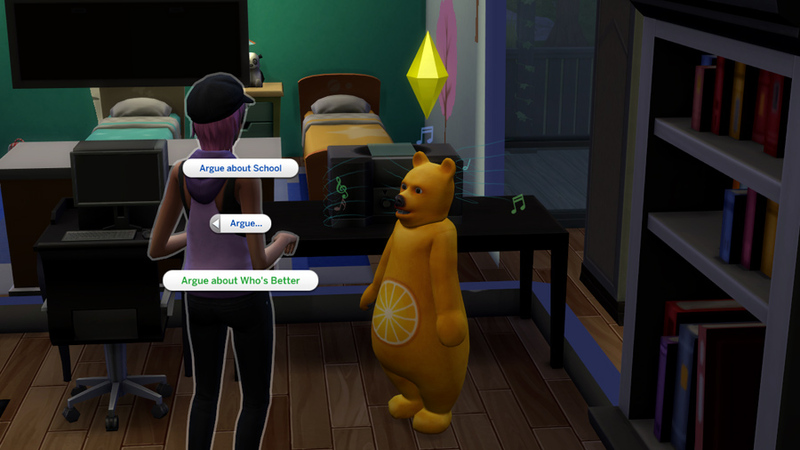 A welcome addition to The Sims 4, which sometimes lacks actual negative outcomes. Teens and children can also go through phases. Parents can talk about the phase with their kids and find out what to do about it. What a great feature! 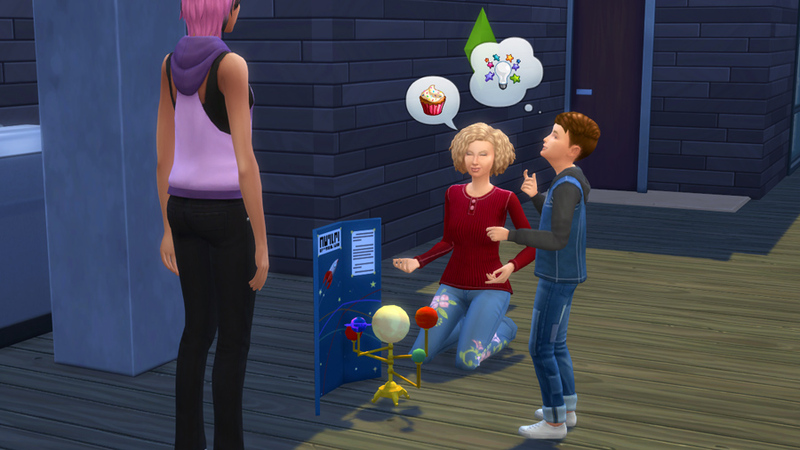 For the kids and teens, phases sometimes grant powerful moodlets like being sad from a mood swing. Or being embarrassed about oneself… which in this case is actually dangerous since phase moodlets always have a value of +50. Don’t die on me! 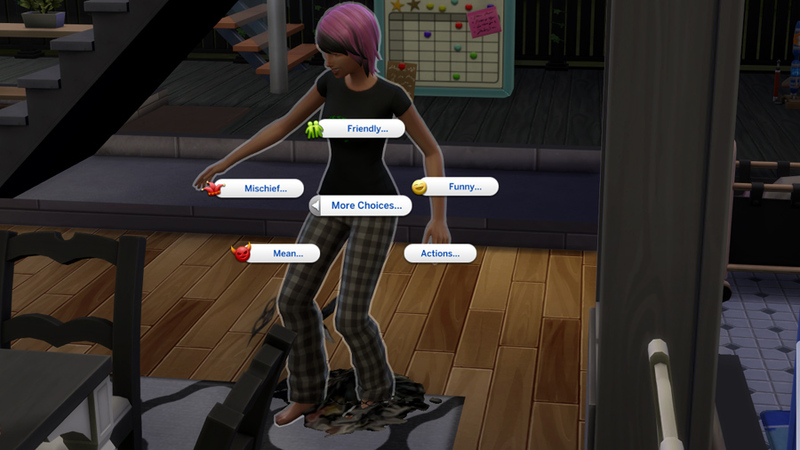 In this case, my teen got through the moodlet alive by sleeping and psyching herself up with a mirror. But man, that gave me a major scare. When a child is being mean, parents can discipline them. You can choose between disciplining calmly or strictly. Highly skilled parents can also discipline firmly or discipline by punishment. One punishment is grounding, which is great fun. You get two choose between 7 different things you can take away from you kid for 24 hours. Any actions that break this grounding are marked with a prison door symbol. And anything to break grounding must be done very stealthily! If you break grounding, parents will come around to reprimand you and you lose responsibility. However, you can just cancel out the reprimanding and go about your business as usual. 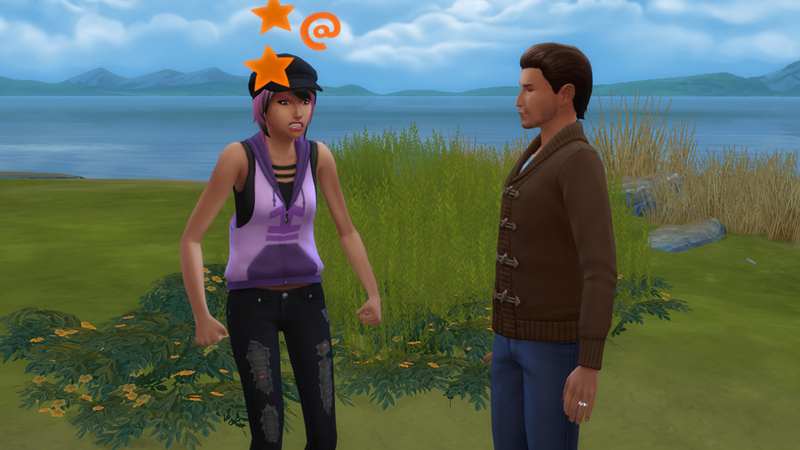 The parents take a long time to notice your bad behavior again after cancelling out the reprimanding interaction… A bit like the jealously system, this system seems to be slightly flawed. Another thing a parent can do is order a timeout! While in timeout, the child can’t do anything apart from sulking. Time outs are fairly short and don’t really change anything about the mood the child is in, but they do affect character values as every disciplining. 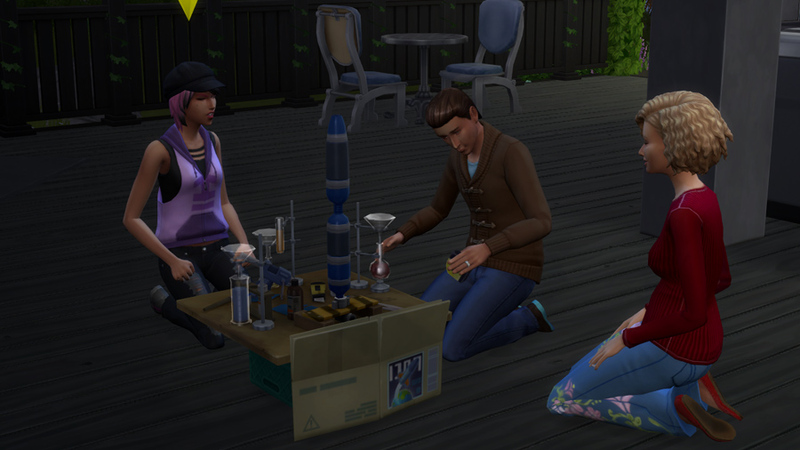 There’s a lack of positive new interactions in this pack. You can decide for yourself whether that’s a good or a bad thing. 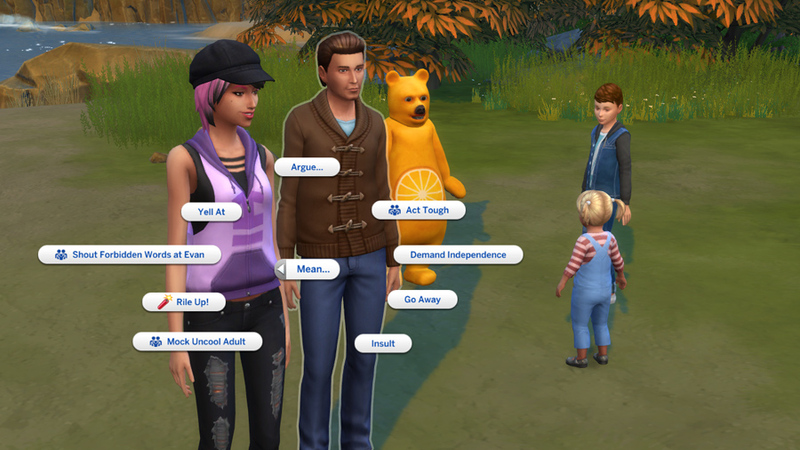 The only positive dialogue options available to all are “Hug lovingly” and “Make funny faces”. Teens have a few more positive interactions though, like obsessing over their favorite band or whining (which is still a friendly interaction O.o). Parents can also teach their kids to say please and thank you, to say sorry or help them with their needs. 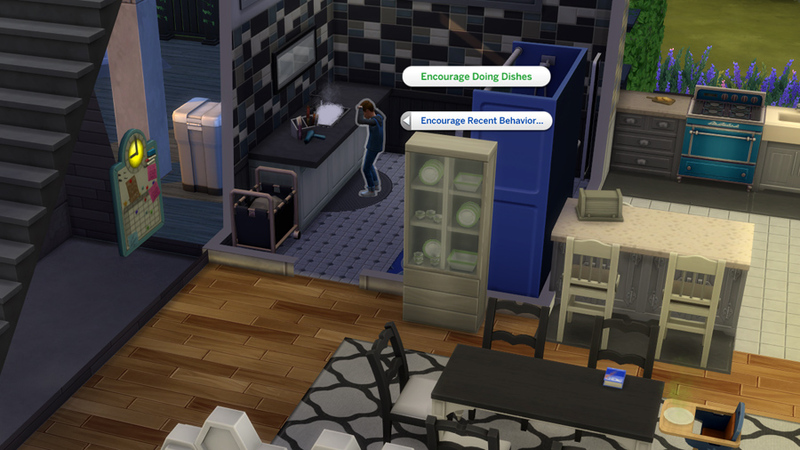 You can also influence them to do things, like doing the dishes. If they’re extremely defiant you can also force them. 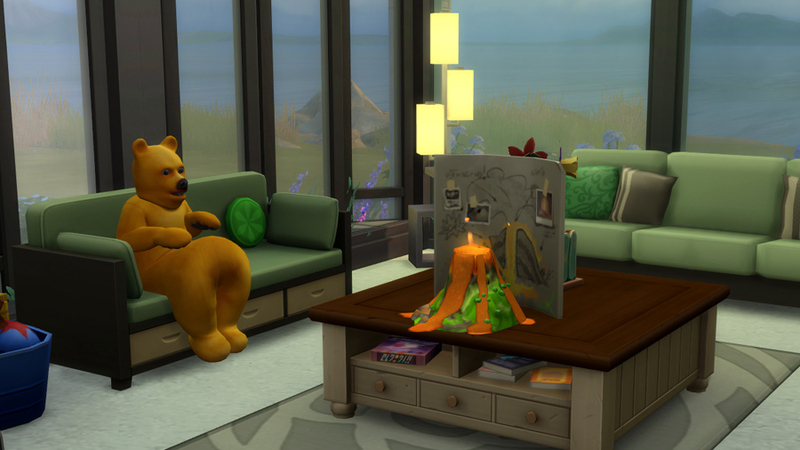 This is the kind of depth I love about this pack! There are so many options for your parent to influence your child’s life. Another new activity in this pack are school projects. There are 7 different projects that can either be bought in buy-mode or kids can bring them home from school. 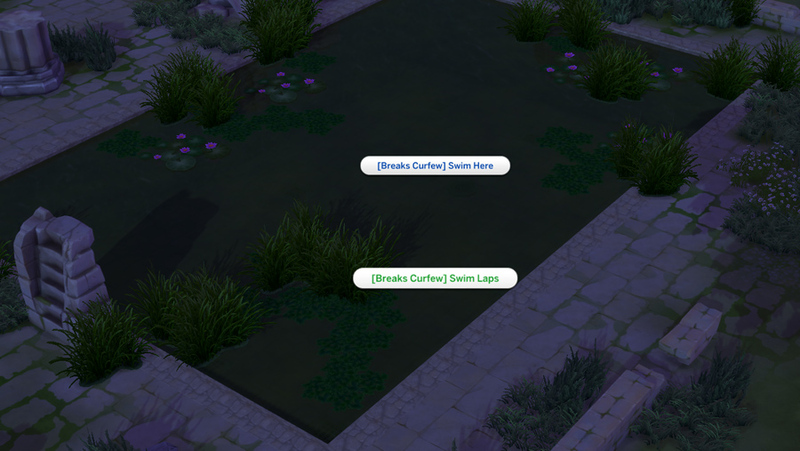 Finished projects can be sold for ~80 Simoleons so getting projects from school can really boost your household funds if you’re playing a money restricted challenge! The projects need quite a bit of space to be placed (6 squares). Kids can choose to work carefully or sloppily. Working carefully takes longer but yields better results. Parents can assist with projects! While parents don’t gain parenting skill from doing this they might gain other skills. 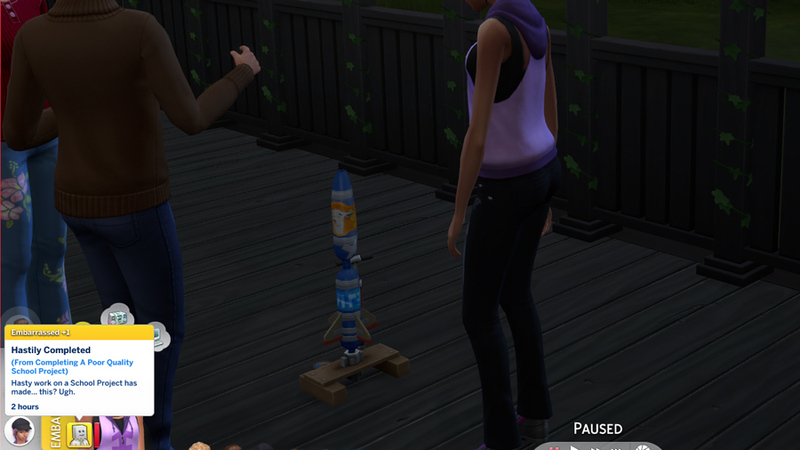 For example, you can gain rocket science skill from assisting with the solar system or the air pressure rocket. Beware that completing projects as a family can also be a source of conflict! 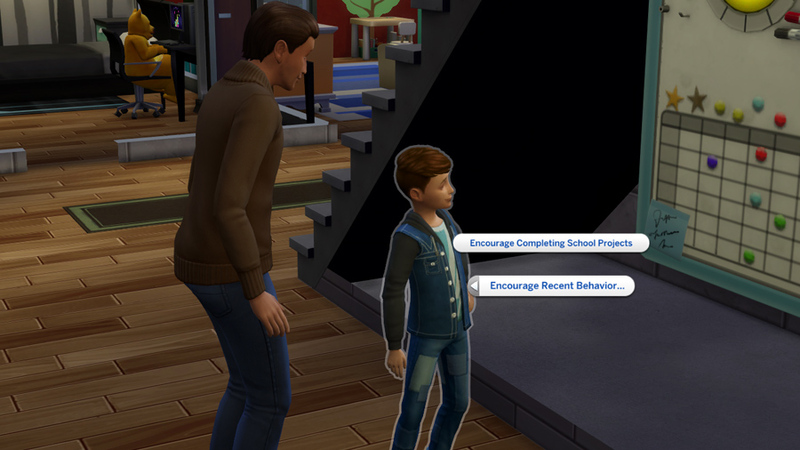 Completed school projects also grant moodlets depending on how well they were completed. School projects are a nice feature. 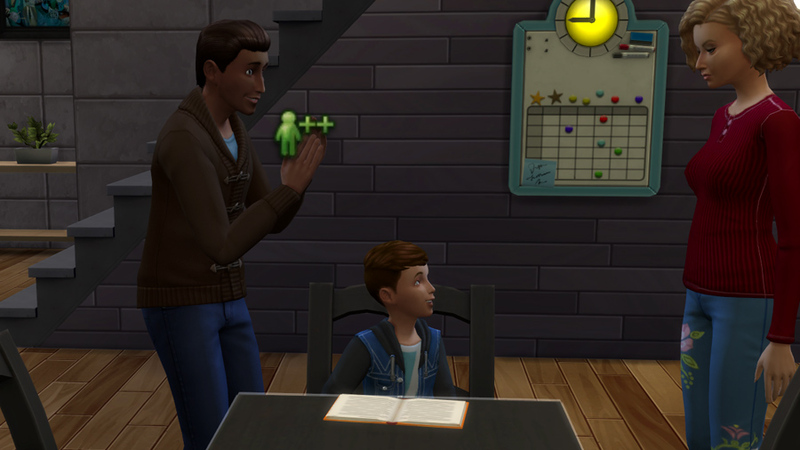 They can bring in cash if you need it, they’re a family activity and boost character values and grades. Also, they’re pretty fun to look at once they’re done! You can also pack any kind of food into a sack lunch for your kids though I’m not sure what use this actually has. Hungry kids get fed at school anyway and sack lunches spoil just as fast as regular food. 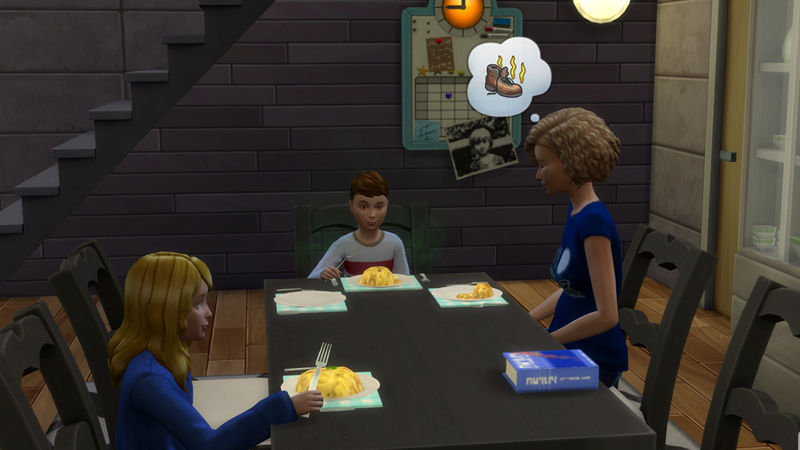 Also children won’t eat their sack lunch autonomously. Well, it’s a fun detail but not really a feature. There are a few little details in this pack that I really enjoy though. 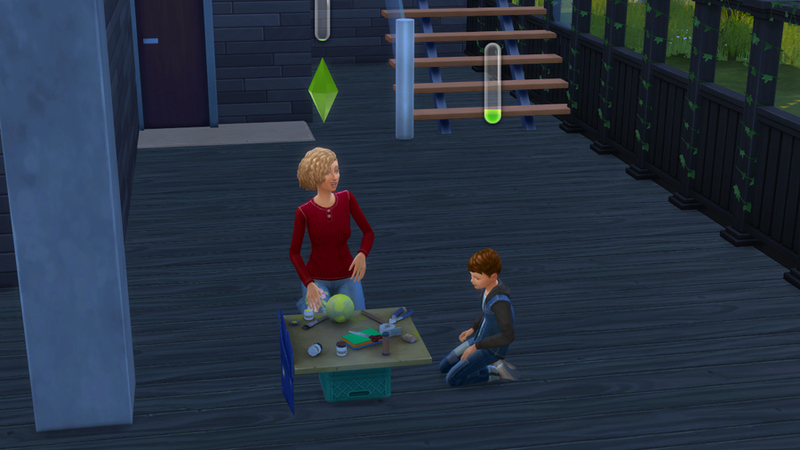 Like teaching toddlers boosting the parenting skill. Or parents being frustrated with other parents on the internet after browing parenting forums. Or the way parents can handle mood swings. 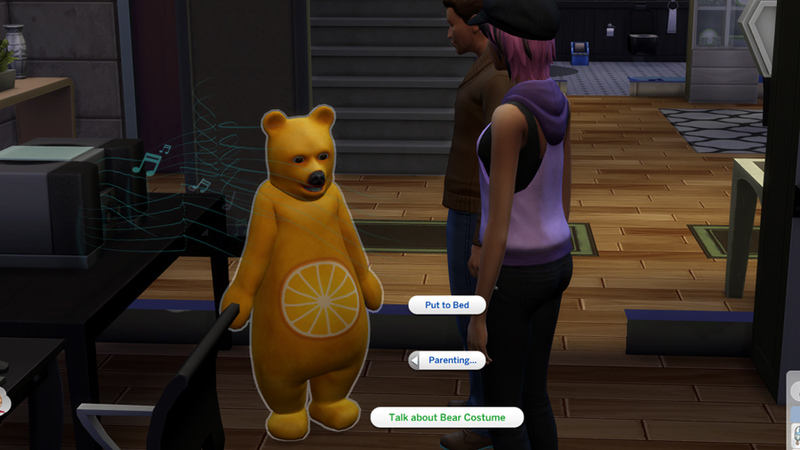 Or kids being able to encourage parents to wear a bear costume. lol. 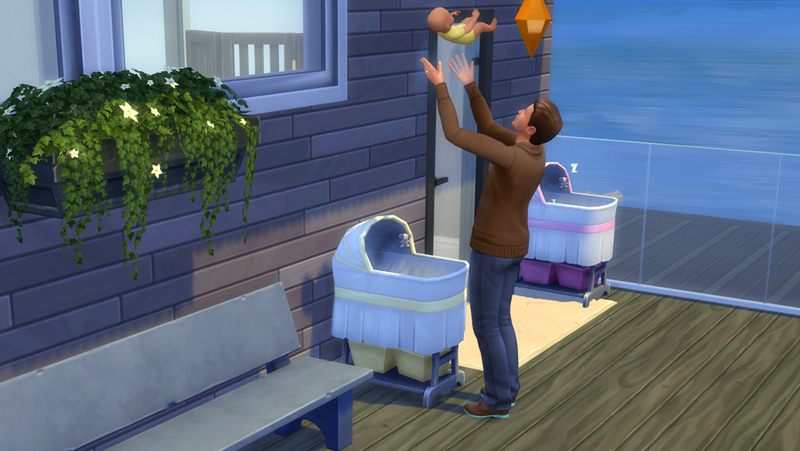 The parenting skill really is the key to fully enjoy this pack. 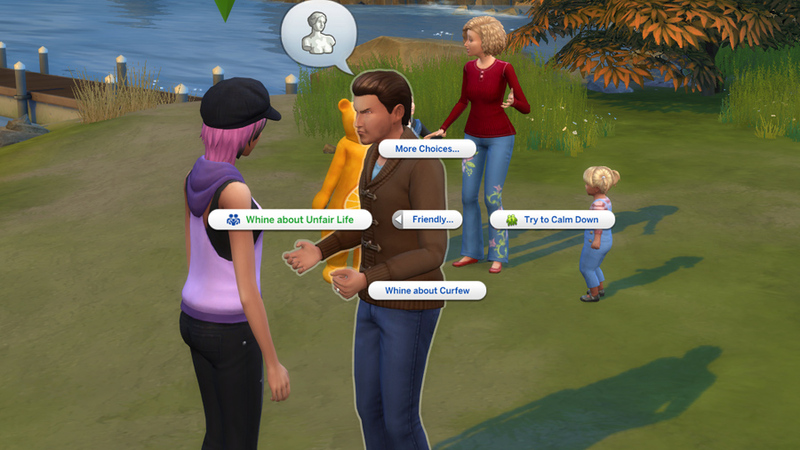 It unlocks most of the fun interactions like grounding and advanced parenting options. Parenting skill also helps with caring for babies. 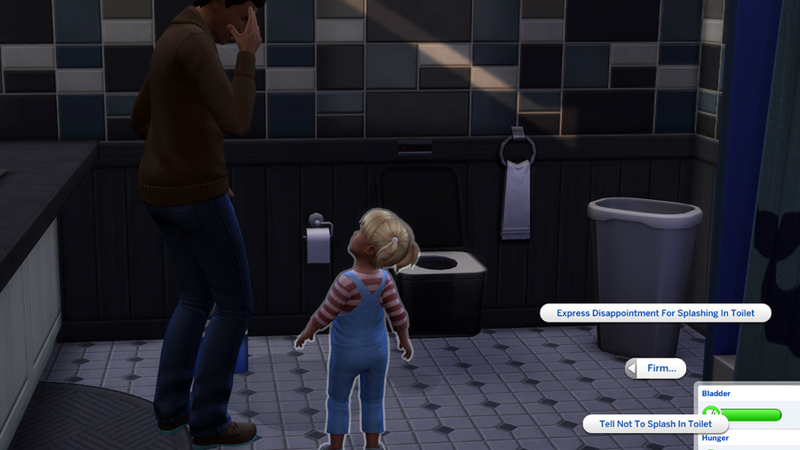 For example level 6 unlocks and interaction that shows exactly what your baby needs when they’re crying. Level 10 even gives you the super efficient baby care action which solves all of a babies needs at once! Sadly, other than this, the baby stage has not been touched and babies are still objects. Sigh. 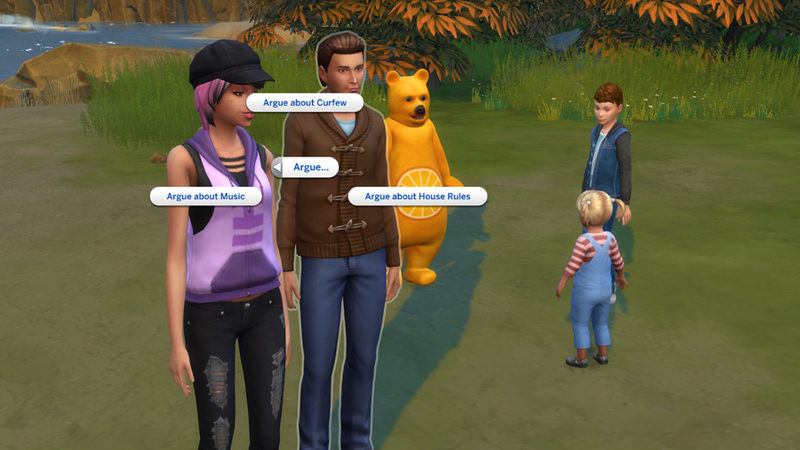 There’s also a new aspiration in this pack called Super Parent. 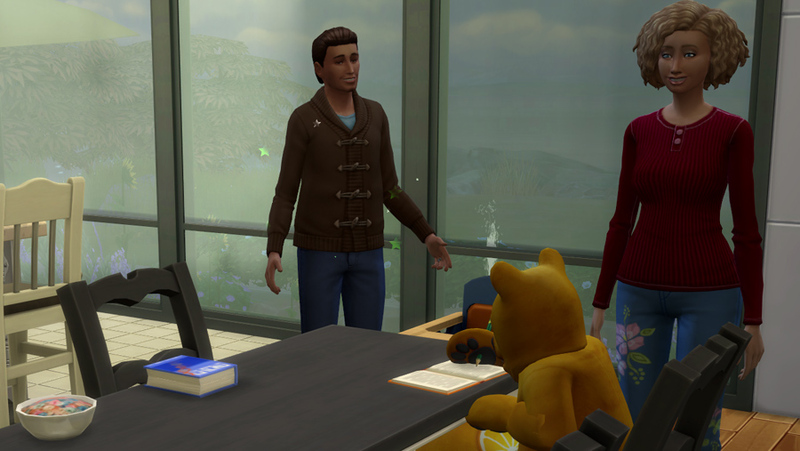 It challenge your sim to become a parent, interact, encourage and discipline their child to shape their future. 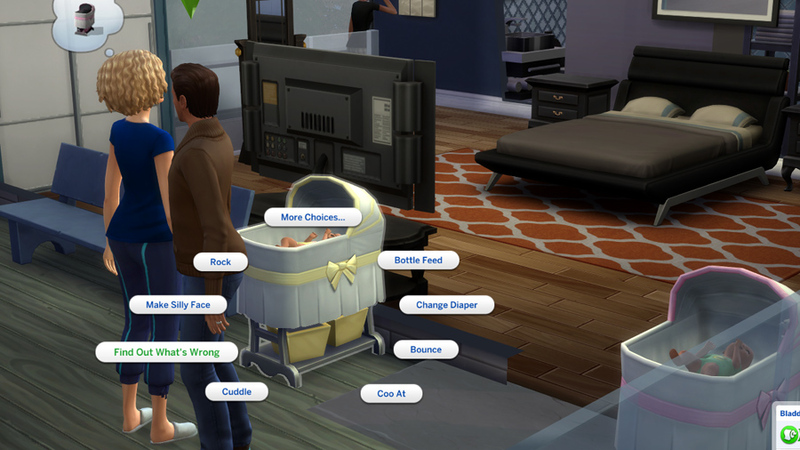 The full parent mode which is unlocked at level 10 of the parenting skill is also very useful. 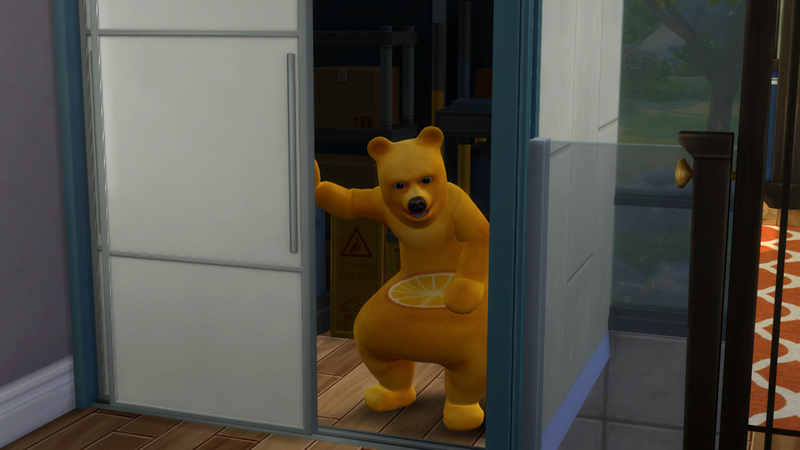 It reminds me a lot of being “In the zone” in The Sims 2 Free Time. Nice. This is a good pack. But while there are many details that make it feel more alive there are also little things that make me feel the pack has just fallen short of it’s potential. Apart from the ones I already metioned, these are things like not being able to reprimand your child for playing in the trash. Or not being able to encourage them for mopping floors or cleaning counters. 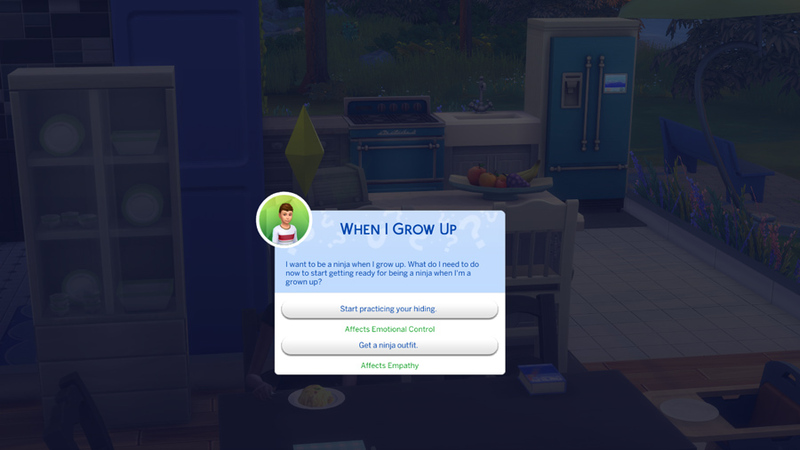 Or that the parenting skill notifications tell me to nudge my kids to play with other kids but there still aren’t any options for kids to just play with each other. This pack had the potential to be the greatest pack of all time. And while it not quite is, I still love most of it. 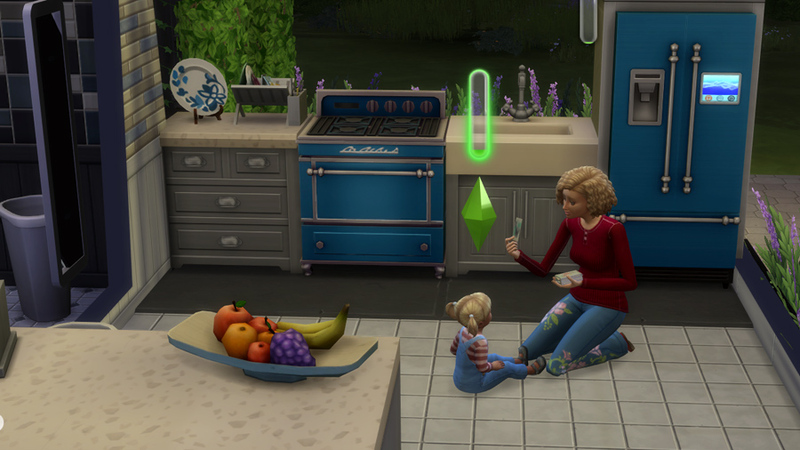 Little details make the game feel more realistic and finally there’s new family play. I’m giving this pack a solid B+ since there are a few things that disappointed me but apart from that it’s a great pack. 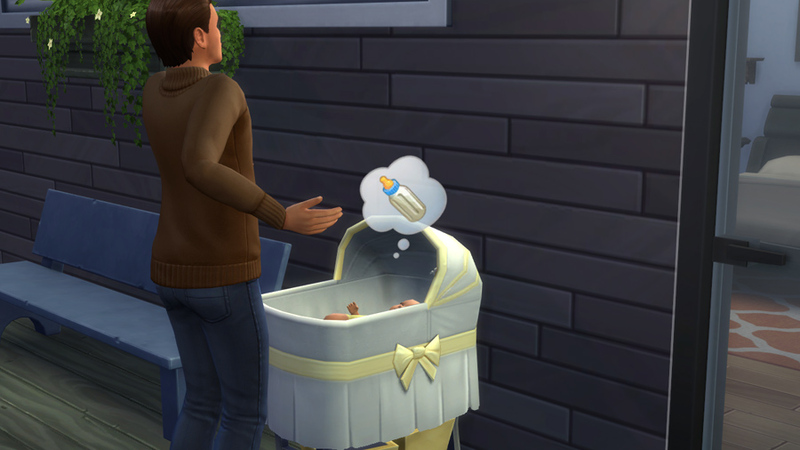 The character values really make parenting seem meaningful and some of the fun little details make my sims feel more like a family. Great review and I feel like this is a firm but fair review. 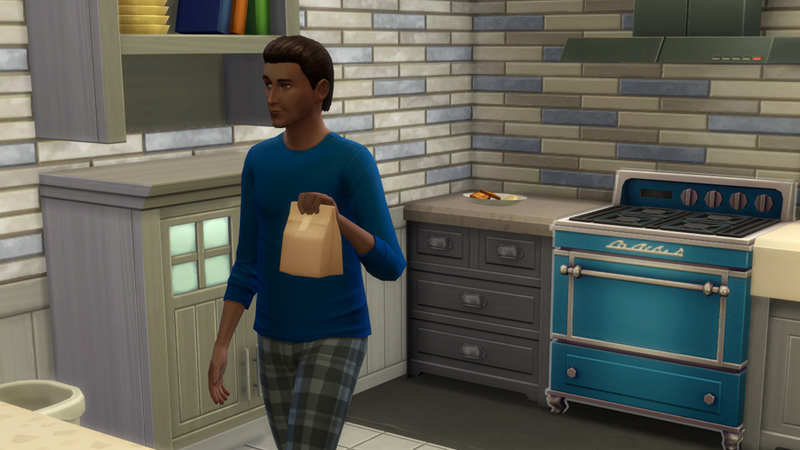 It is my favourite pack so far but there was still some things that fell a little short or expectations and I think this review fairly captures the critics these things. Yassss and it’s so awesome! Great review! It’s so nice to see a written review. It was well thought out and detailed which video reviews usually aren’t. I was already planning to get the pack but I’m glad to see it’s mostly living up to all the hype before buying it. Such a detailed review! Thanks! It actually sounds a lot better than I was expecting ! I like the journal and character traits ! Just like you, I was a little let down about this pack after watching the live stream. All of the things that you highlighted as the pros are the reasons why I will ultimately get this pack but I also feel like there was a lot of untapped potential with this theme. 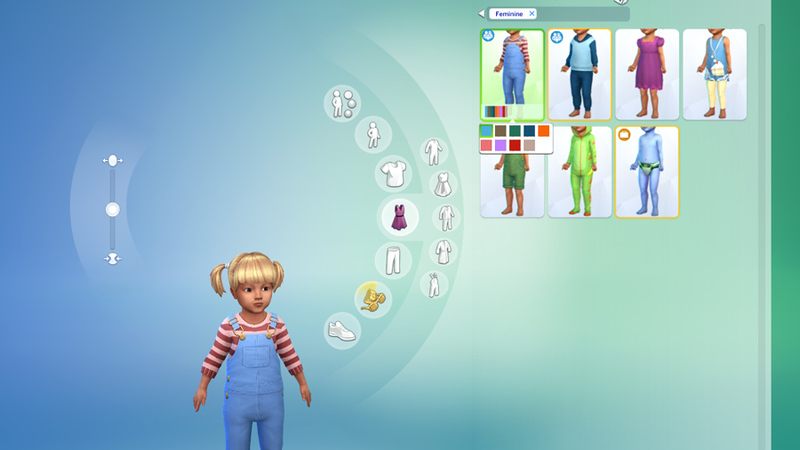 I really wanted some new toddler hair but at least we got some new toddler outfits so there’s that. 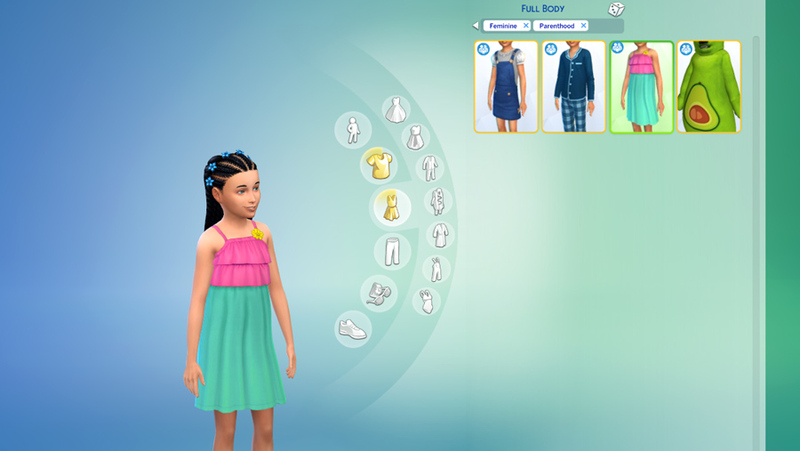 I also like the clothing options for kids and those teen-centric hairstyles and clothing are nice too. 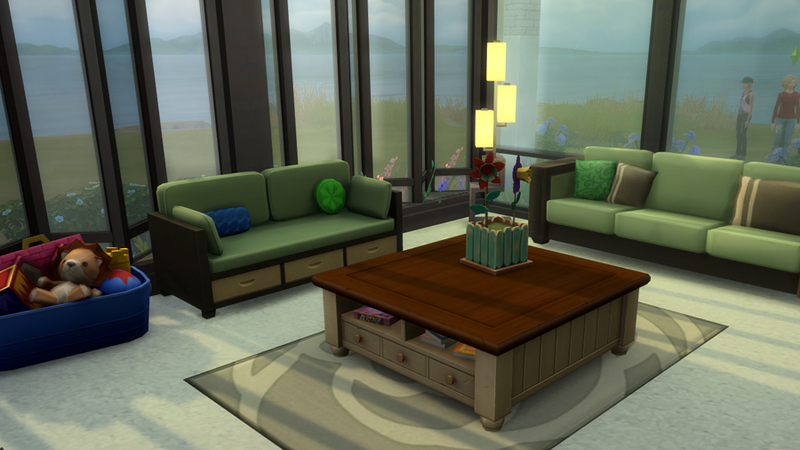 A lot of the clutter items are really nice. 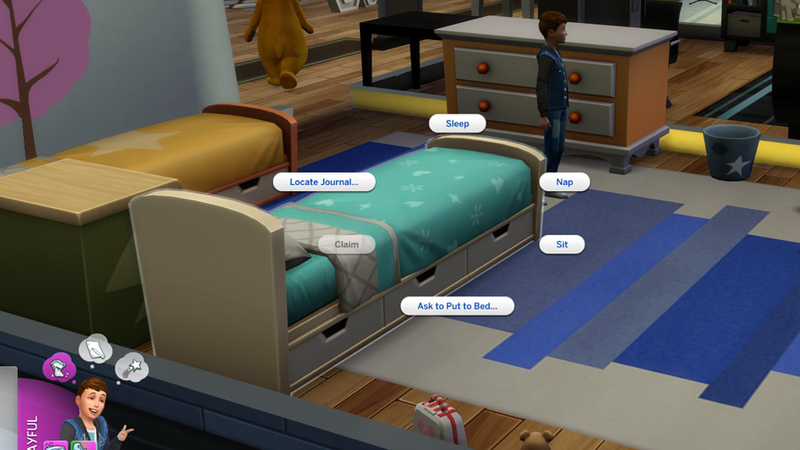 Modern homes look nice in the game but I always have my sims end up in more traditional homes that are ‘lived-in’ so the new buy mode items are right up my alley, but I thought this pack would be the pack where bunk beds would make an appearance. 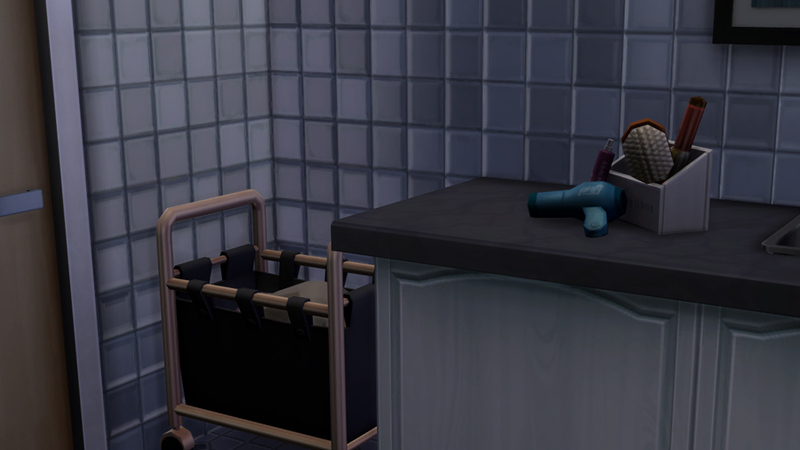 Bunk beds came in so handy in TS3 because I could fit 4 kids into one bedroom and not be forced to extend the house. 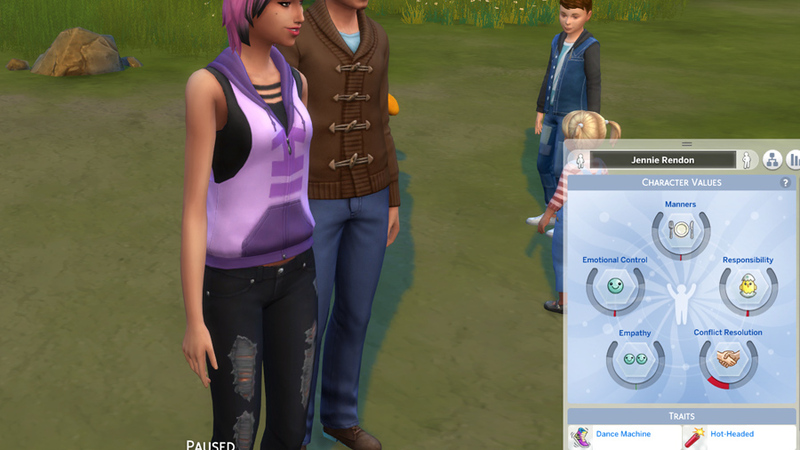 There are a lot of things I think could have been in this pack but hopefully when I actually get it I’ll be satisfied with what I got because I’ve been wanting more parent-child interactions since base game came out.